For other uses, see Tlatelolco (disambiguation). Tlatelolco (Classical Nahuatl: Mēxihco-Tlatelōlco [tɬateˈloːɬko], modern Nahuatl pronunciation (help·info)) (also called Mexico Tlatelolco) was a prehispanic altepetl or city-state, in the Valley of Mexico. Its inhabitants were known as Tlatelolca. The Tlatelolca were a part of the Mexica, a Nahuatl-speaking people who arrived in what is now central Mexico in the 13th century. The Mexica settled on an island in Lake Texcoco, founding the altepetl of Mexico-Tenochtitlan on the southern portion of the island. In 1337, a group of dissident Mexica broke away from the Tenochca leadership in Tenochtitlan and founded Mexico-Tlatelolco on the northern portion of the island. Tenochtitlan was closely tied with its sister city, which was largely dependent on the market of Tlatelolco, the most important site of commerce in the area. 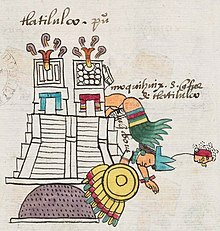 Defeat of the Tlatoani of Mexico-Tlatelolco, Moquihuix, in 1473, according to Codex Telleriano-Remensis. After the completion of the two-year Spanish Conquest of the Aztec Empire in 1521, the Spanish conquerors established the ruins of Mexico-Tenochtitlan as the Spanish capital of New Spain. The remnants of the indigenous populations of Tenochtitlan and Tlatelolco following the conquest were administered by indigenous elites in the incorporated Indian towns of Santiago Tlatelolco and San Juan Tenochtitlan. Tlatelolco remained an important location in the colonial era, partly because of the foundation there of the school for elite indigenous men, the Colegio de Santa Cruz de Tlatelolco, which was the first school of higher learning in the Americas. Today its remains are located within Mexico City. In the twentieth and twenty-first centuries, archeological excavations have taken place at the Tlatelolco (archaeological site) in what is now part of Mexico City. The excavations of the prehispanic city-state are centered on the Plaza de las Tres Culturas, a square surrounded on three sides by an excavated Aztec site, a 17th-century church called Templo de Santiago, and the modern office complex of the Mexican foreign ministry. 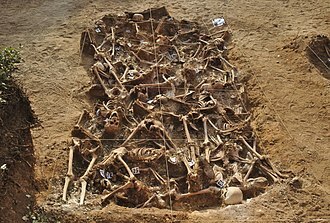 In February 2009, the discovery of a mass grave with 49 human bodies was announced by archaeologists. The grave is considered unusual because the bodies are laid out in ritual fashion. ^ Matos Moctezuma, Eduardo. "Tlatelolco". The Oxford Encyclopedia of Mesoamerican Culture, vol. 3, pp. 230-31. ^ "Aztec 'warrior' mass grave found". BBC. 12 February 2009. Anales de Tlatelolco, unos annales históricos de la nación mexicana y Códice de Tlatelolco. Edited by Heinrich Berlin and Robert H. Barlow. Mexico 1948. Barlow, Robert H. Tlatelolco, rival de Tenochtitlan. Edited by Jesús Monjarás-Ruiz, Elena Limón, and María de la Cruz Paillés Hernández. Mexico City and Puebla 1987. Castañeda de la Paz, María (2008). "Apropiación de Elementos y Símbolos de Legitimidad entre la Nobleza Indígena. El Caso Del Cacicazgo Tlatelolca." Anuario De Estudios Americanos. Directory of Open Access Journals. Chimalpahin Cuauhtlehuantzin, Domingo Francisco de San Antón Muñon. Codex Chimalpahiin: Society and Politics in Mexico Tenochtitlan, Tlatelolco, Texcoco, Culhuacan, and Other Nahua Altepetl in Central Mexico. Arthur J.O. Anderson et al. Norman, Oklahoma: University of Oklahoma Press 1997. Garduño, Ana. Conflictos y alianzas entre Tlatelolco y Tenochtitlan. Mexico City 1998. Guilliem Arroyo, Salvador. Ofrendas a Ehecatll-Quetzalcoatl en Tlatelolco. Coleccion Científica INAH Num. 400. 1999. Mexico. Matos Moctezuma, Eduardo. "Tlatelolco" in The Oxford Encyclopedia of Mesoamerican Culture, vol. 3, pp. 230-31. Oxford University Press 2001. 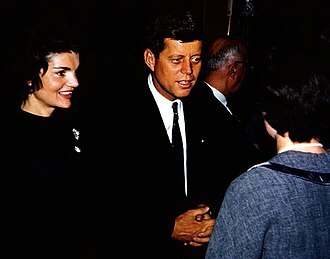 For this reason the alternative terms of Precontact Americas, Pre-Colonial Americas or Prehistoric Americas are in use. In areas of Latin America the term used is Pre-Hispanic. Other civilizations were contemporary with the period and were described in European historical accounts of the time. A few, such as the Maya civilization, had their own written records, because many Christian Europeans of the time viewed such texts as heretical, men like Diego de Landa destroyed many texts in pyres, even while seeking to preserve native histories. Only a few documents have survived in their original languages, while others were transcribed or dictated into Spanish, giving modern historians glimpses of ancient culture. Indigenous American cultures continue to evolve after the pre-Columbian era, many of these peoples and their descendants continue traditional practices, while evolving and adapting new cultural practices and technologies into their lives. Now, the study of pre-Columbian cultures is most often based on scientific. Asian nomads are thought to have entered the Americas via the Bering Land Bridge, now the Bering Strait, genetic evidence found in Amerindians maternally inherited mitochondrial DNA supports the theory of multiple genetic populations migrating from Asia. Over the course of millennia, Paleo-Indians spread throughout North and South America, exactly when the first group of people migrated into the Americas is the subject of much debate. 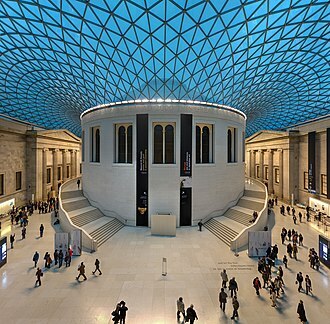 One of the earliest identifiable cultures was the Clovis culture, with sites dating from some 13,000 years ago, older sites dating back to 20,000 years ago have been claimed. Some genetic studies estimate the colonization of the Americas dates from between 40,000 and 13,000 years ago, the chronology of migration models is currently divided into two general approaches. The first is the short chronology theory with the first movement beyond Alaska into the New World occurring no earlier than 14, 000–17,000 years ago, followed by successive waves of immigrants. The second belief is the long chronology theory, which proposes that the first group of people entered the hemisphere at an earlier date, possibly 50. 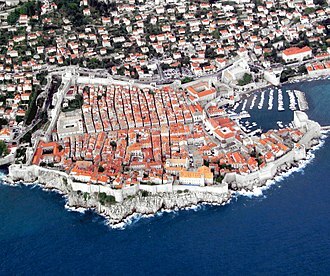 It was inaugurated on January 6,1536, however, it had been a functioning school since August 8,1533. While Bishop of Santo Domingo, Ramírez de Fuenleal had encouraged the Franciscans to teach the sons of Indians grammar in their language of Nahuatl. Franciscan Arnaldo de Basccio began the task with success, which gave support to the project of establishing an institute of higher learning. Ramírez de Fuenleal urged the crown to provide funds to establish, still others were founded by Franciscans in this early period. These schools for Indian and mestizo boys taught basic literacy, but singing, instruction in how to help with the mass, and sometimes manual labor. 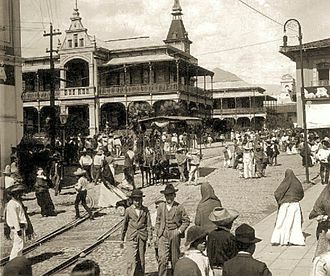 The primary education of Indian girls was a concern and schools were established in Mexico City, but not until the establishment of the Colegio de Santa Cruz were sons of Indian men given higher education. Bishop Juan de Zumárraga was a supporter of the establishment of the colegio, but credited Fuenleal, the colegio was inaugurated on January 6,1536, the feast of the Epiphany, deliberately chosen for its symbolism of calling the gentiles to the true faith. 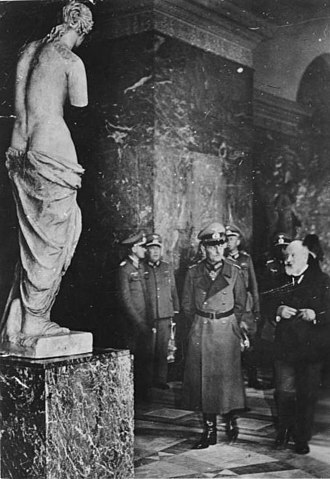 He went on to refute concerns about the possibility of the Indians spreading heresy, betanzos in his opposition to the colegio said that Native Americans who knew Latin could expose the ignorance of the existing European priests, an argument that perhaps unwittingly did the same. 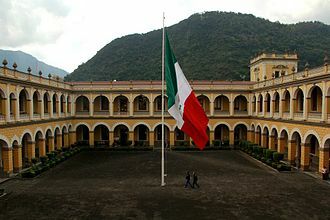 The original purpose of the colegio was to educate a male indigenous priesthood and these young men were taught to be literate in Nahuatl and Latin, and received instruction in Latin in music, rhetoric and philosophy, and indigenous medicine. One student educated at the colegio was Nahua botanist Martín de la Cruz, who wrote the Libellus de Medicinalibus Indorum Herbis, actual instruction at the colegio was by two Franciscans at a time, aided by Indian assistants. Other Franciscans who taught there were Fray Juan de Goana, Fray Francisco de Bustamante, Fray García de Cisneros, Fray Arnaldo de Basaccio, Fray Juan de Torquemada served as a teacher and administrator at the Colegio. Fray Alonso de Herrera preached the sermon at the opening Mass, following the religious ceremony, there was a banquet hosted by Zumárraga for guests and the first pupils, chosen from the convent of San Francisco de México. Azcapotzalco was a pre-Columbian Nahua altepetl, capital of the Tepanec empire, in the Valley of Mexico, on the western shore of Lake Texcoco. The name Azcapotzalco means at the anthill in Nahuatl, according to the 17th century annalist Chimalpahin, Azcapotzalco was founded by Chichimecs in the year 995 AD. The most famous ruler of Azcapotzalco was Tezozomoctli, according to chronicler Fernando Alva Ixtlilxóchitl the Tepanecs were a Chichimec group and settled in 1012 in the region west of Lake Texcoco. Its lineage begins when their Acolhua leader marries Xolotls daughter Cuetlaxochitzin, but this information is rather in a mythical context, Acolnahuacatls life is registered much later. Chimalpahin places their settlement before, in 995, continuing with data provided by Chimalpahin, he mentions that Tepanec entered the Triple Alliance from 1047. The documents indicate that last line starts with Matlacohuatl, Azcapotzalco was founded in the 13th century in the west of Lake Texcoco. Azcapotzalco maintained a dominant hegemony with the Aztecs, who arrived in 1299, settling on the Chapultepec Hill, in 1318 for the first time they attacked the Aztecs, which resulted in an increased tribute and greater participation in military campaigns. Around of 1315, the Tepanec and Chichimec drove the Aztecs definitively from Chapultepec, Cópil was captured and killed by the Aztecs. His heart was ripped out and thrown into the River, according to a legend, Huitzilopochtli had to kill his nephew, Cópil and threw his heart in the Lake. However, since Cópil was his relative, Huitzilopochtli decided to honor him and made a cactus grow over Cópil heart, the Aztecs attempted to ally with the Colhua to confront the Tepanec, they were allowed to settle in Tizapán, near Colhuacan. In 1323, the Aztecs slaughtered a Colhua Princess in front of her father, the Colhua had been expelled from Tizapán and immediately declared war. The Aztecs called for immediate Azcapotzalco protection, and from this point forward they were subject to military, at Acolnahuacatls death, his son Tezozomoc, only 23 years old, took his place, Tezozomoc may be the most important and crucial post-classical period figure. During his reign, Azcapotzalco reached its greatest splendor, at the time of his death in 1426, Azcapotzalco was an authentic Hueyi Tlahtohcayotl, it controlled trade routes at least 40 altépetl. Tlacateotl was the second Tlatoani of the Aztec city of Tlatelolco from 1417 until his death. 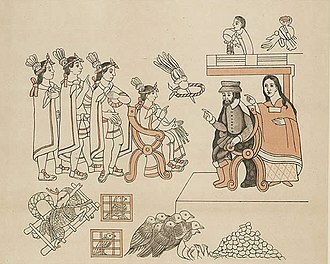 Under his rule the Tlatelolcas continued to expand their wealth and influence within the valley of Mexico, through trade and tribute, the citys market grew to include trade in wool and quetzal feathers. 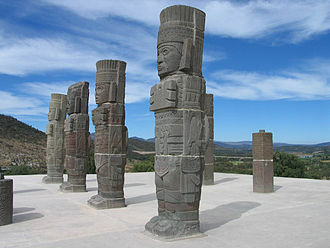 Tlacateotl ordered the removal of sculptures from the ruins of Tula to decorate the growing city and his reign ended in 1427/8 during the succession struggle in Azcapotzalco between Tayatzin and Maxtla. He is recorded as having been stoned to death while traveling by canoe, Maxtla is commonly assumed to have ordered the murder, possibly due to a suspected affair between Tlacateotl and Maxtlas wife. He was succeeded by his grandson, Quauhtlatoa and he succeeded his father, upon his death in 1417. He was a brother of the queens Matlalatzin and Huacaltzintli and grandson of the famous king Tezozomoc and he was a cousin of Emperor Chimalpopoca and uncle of the prince Tezozomoc. He was a father of the kings Tezozomoctli and Itzquauhtzin and grandfather of Quauhtlatoa and his wives were called Xiuhtomiyauhtzin and Xiuhcanahualtzin. Axayacatl was the sixth tlatoani of the altepetl of Tenochtitlan and ruler of the Aztec Triple Alliance. Axayacatl was a son of the princess Atotoztli II and her cousin and he was a grandson of the Emperors Moctezuma I and Itzcoatl. He was a descendant of the king Cuauhtototzin and he was a successor of Moctezuma and his brothers were Emperors Tixoc and Ahuitzotl and his sister was the Queen Chalchiuhnenetzin. He was an uncle of the Emperor Cuauhtémoc and father of Emperors Moctezuma II and it is important that the Great Sun Stone, known as the Aztec Calendar, was carved under his leadership. In the year 1475 there was an earthquake that destroyed many homes in Temochtitlán. Using as a pretext the insulting behavior of a few Tlatelolcan citizens, Axayacatl invaded his neighbor, killed its ruler, the Tlatelolcans lost any voice they had in forming Aztec policy. In spite of his age, he fell gravely ill in 1480, passing away a mere year later, in 1481. List of Tenochtitlan rulers Davies, the Aztec Empire, The Toltec Resurgence. The Broken Spears, The Aztec Account of the Conquest of Mexico is a book by Miguel León-Portilla, translating selections of Nahuatl-language accounts of the Spanish conquest of the Aztec Empire. 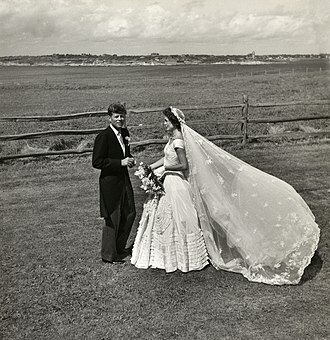 It was first published in Spanish in 1959, and in English in 1962, the most recent English edition was published in 2007. The English-language title, The Broken Spears, comes from a phrase in one version of the Annals of Tlatelolco, xaxamatoc omitl. According to James Lockhart, this is a resulting from confusion between the Nahuatl words mitl arrow, dart or spear, and omitl bone, an alternative translation is thus broken bones. León-Portilla prefaces the sources he chose for the book not only background on the events. The following sections break down the role of the war, the effect of disease. These relations are marked by letters written to the Spanish Crown, notably Philip II of Spain, the accounts vary from pleading to King Philip II for audiences, to fears manifesting in centuries for Nahua identity clashing with colonial Spain. A mass grave is a grave containing multiple human corpses, which may or may not be identified prior to burial. Although mass graves can be used during major conflicts, in modern times they are usually seen after events such as a major famine, epidemic. Mass graves are a variation on common burial, still practiced today under normal circumstances. Mass or communal burial was a practice before the development of a dependable crematory chamber by Ludovico Brunetti in 1873. 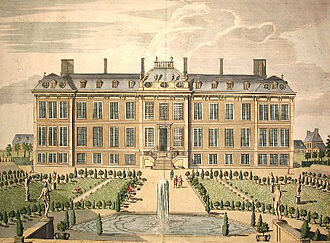 In Paris, the practice of burial, and in particular. The remains were removed and placed in the Paris underground forming the early Catacombs, la Cimetière des Innocents alone had 6,000,000 dead to remove. Burial commenced outside the city limits in what is now Père Lachaise Cemetery, mass graves are usually created after a large number of people die or are killed, and there is a desire to bury the corpses quickly for sanitation concerns. In disasters, mass graves are used for infection and disease control, in such cases, there is often a breakdown of the social infrastructure that would enable proper identification and disposal of individual bodies. 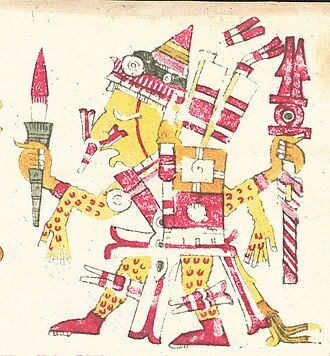 Tezcatlipoca depicted in the Codex Borgia. 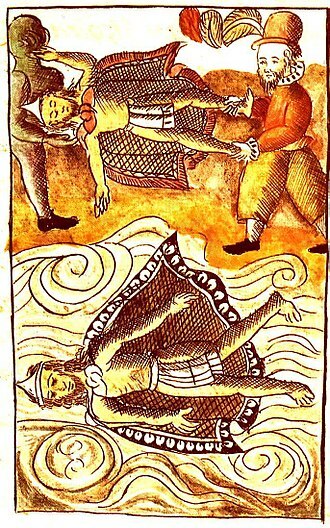 Xipe Totec "Our flayed lord" wearing a human skin depicted in the Codex Borgia. Xochipilli wearing a deerskin as depicted in the Codex Borgia. 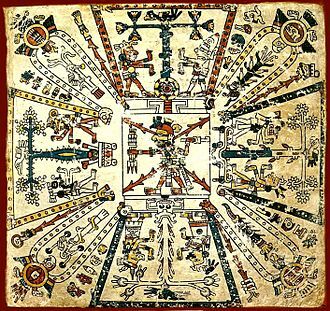 Aztec cosmological drawing with the god Xiuhtecuhtli, the lord of fire and of the Calendar in the center and the other important gods around him each in front of a sacred tree. From the Codex Fejérváry-Mayer. Mass grave of 26 victims of the Spanish Civil War in 1936, excavated in 2014. Victims of bubonic plague in a mass grave from 1720 and 1721 in Martigues, France. Moquihuix's death as depicted in the Codex Mendoza. 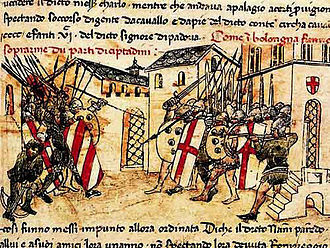 Moquihuix fighting a Tenochca warrior, in the Codex Telleriano-Remensis. 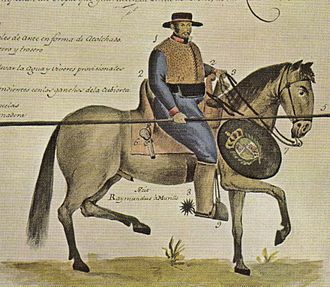 Conquistador Nuño Beltrán de Guzmán as depicted in Codex Telleriano Remensis.